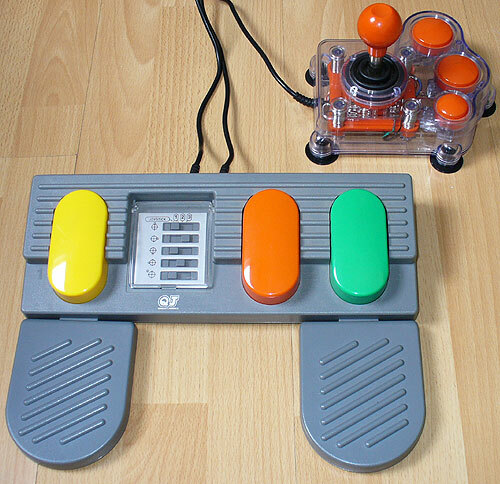 A large Joystick with three pedal controller giving control over up, down, left, right and fire (or left mouse click). Play games, browse the web and more using this versatile set-up. Using with JoyToKey software enables this controller to act as a mouse, or any combination of keys on a PC keyboard that you can fit. Reconditioned Joystick with new old stock pedals and new Stelladaptor. USB connection via a Stelladaptor for PC use. Joystick can be set for left or right handed use. Also features an Auto-Fire switch. Compatible with JoyToKey - use the pedals and joystick to control your mouse. Similarly, use with a huge range of PC software and games, in many different ways. It's possible to set every control as the SPACE bar for playing one-switch games. Compatible with retro games machines using Atari joystick ports.